If you win this prize, Christmas is sorted! The Loose Women and This Morning competition shown morning and daytime on ITV, STV & UTV are giving away £50,000 cash (it’s tax-free) and a bundle of the most sought after Christmas gifts and gadgets, all in time for the Christmas day! Brands included in the bundle are Nespresso, Dyson, Amazon, Nintendo, Sony, Bose, Google and JBL. There’s no question to answer, it’s a prize draw format however you must be contactable on on Friday 7th and Monday 10th December. Online Instructions: Find the competition on itv.com/win and follow the instructions. Each entry costs £2. Phone Instructions: Dial 09068 781 119 and follow instructions.. Each call will cost £2 plus your network access charge. 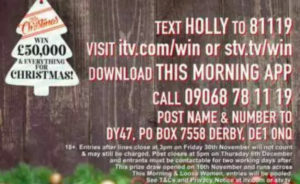 SMS Instructions: Send an SMS text message with the text “WINNER” to 81119 (NOTE: the ITV website says to text “WINNER”…whilst the TV announcement says to text “HOLLY” – proceed with caution!). Texts costs £2 plus your standard network rate to send an SMS message. If you do not want to receive SMS marketing texts, add “NO INFO” at the end of your SMS text eg “WINNER NO INFO”. Postal Instructions: Send your Name and a full contact telephone number to: DY47, PO Box 7558, Derby, DE1 0NQ. Other Competition Information: Multiple entries to the prize draw are permitted. These are explained in the detailed terms and conditions on itv.com/win or stv individual competition page. Winners are usually drawn 1 week after the final closing date. There are 5 runners up prizes of around £250 – that’ll help for Christmas! Please see the competition promotor website for full T&Cs. Remember to check the Loose Women and This Morning promoter instructions, terms and conditions on itv or stv! As you can see above, the TV instructions say to text “HOLLY”…whilst the website says to text “WINNER”; this is happening with a lot of ITV competitions. Good luck in the competition and happy Christmas!